आजकाल आपण लोकांची प्रतिष्ठा त्यांच्या गाड्या, कपडे यावरून जोखतो. पण जुन्या काळी काय होतं? जुन्या काळात मीठ यासाठी का महत्त्वाचं होतं ते आज जाणून घेऊ. People’s perception of salt has changed from the past to the present – so how has it changed and why? बदलत्या काळासोबत माणसाचं मिठाबद्दल मत बदललं आहे. का आणि कसं? -How do we measure wealth nowadays? -Do you think salt a good or bad thing? -Why could salt have been important in the past? Hello! ऐकलंत का?Listen Here! मध्ये तुमचं स्वागत. मी तेजाली आणि माझ्यासोबत आहे सॅम आणि टॉम. And I’m James! Hi everybody! आज आपण बोलणार आहोत wealth म्हणजे संपत्ती आणि status म्हणजे प्रतिष्ठेबद्दल. So James, how do people in the UK show their wealth or status? Well, in many different ways! The clothes they wear, the cars they drive, the shops they visit or the size or location of their house. How about in your country? आमच्याकडे बरेचदा व्यक्तीचं काम, समाजातलं वजन, त्याचं राहणीमान यावर व्यक्तीची प्रतिष्ठा ठरते. आता या क्लिपचा पहिला भाग ऐकू. पूर्वीच्या काळी सामाजिक प्रतिष्ठा दर्शवण्यासाठी मिठाचा वापर कसा होत असे याबद्दल सूझी डेंट सांगतायत. त्या शब्दकोशकार आहेत. हे कधीपासून सुरू झालं? ऐकूया. If you look in the Oxford English dictionary, there are just entry after entry which clearly reflects how important it (salt) has been. But it also became a great symbol of social wealth and social status. You’ll find this in medieval times right up to the 18th century. Wow, salt was important in medieval times! But it’s so common nowadays! Medieval times म्हणजे मध्ययुग. That’s true! Salt was very expensive, and was therefore a way to show you were wealthy, that you could afford salt. Afford म्हणजे परवडणे. 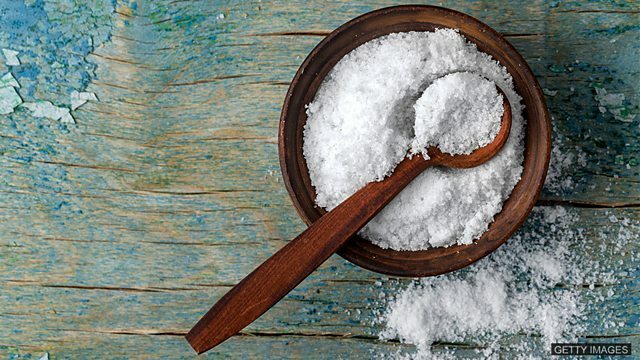 Let’s listen on - how was salt used to show people’s social status. The rank of guests at a banquet for example was gauged by exactly where they sat in relation to a silver salt cellar that was placed on the table. The distinguished guests would sit at the head of the table, above the salt, and people who sat below the salt, furthest away from the host, were the ones who were least important. So the closer to the salt that people were sat, the more important they were! Two common phrases we use in English because of this are ‘above the salt’ and ‘below the salt’ – meaning ‘important’ or ‘not important’. ‘Above the salt’ म्हणजे म्हणजे महत्त्वाची व्यक्ती, below the salt म्हणजे कमी महत्त्वाची व्यक्ती. Let’s keep listening to find more of these expressions. If you look at Shakespeare, for example, you will find salt as a symbol of liveliness and freshness. So Shakespeare talks about the salt of youth. So someone who is lively म्हणजे जिवंत, रसरशीत आणि passionate म्हणजे भावूक आणि उत्कट about their job for example, has the salt of youth? Exactly! Let’s listen for more. And of course in the Bible you’ll find the salt of the earth, people who have great kindness and integrity. एखादी व्यक्ती kind म्हणजे दयाळू आणि integrity असलेली म्हणजे प्रामाणिक असेल तर अशा व्यक्तीला Salt of the earthम्हणतात. Yes! People who do things for others are the salt of the earth. So all of these phrases are very positive, which shows how important salt was to people in the past. That’s right, but that seems strange! Nowadays, salt is something which people try to avoid. A salty diet is not very good for you. Has this changed the way that people use the word salt James? Yes, in fact it has! But now, in modern times there’s been a shift in that, you know, you demonise it now as a bad thing. Yes, actually in slang we might just be able to detect that downturn because salty now, in slang, means irritable really or hostile even. Salty, याला इंग्रजीत समानार्थी शब्द आहेत aggressive, bitter. Agressiveम्हणजे आक्रमक, bitterम्हणजे कडवट. So, have the phrases we use with salt changed with people’s opinions? That’s right – people’s attitudes to salt are now quite salty! How about you? Do you have a salty attitude to salt? Are you salt of the earth? आज आपण मिठासंबंधित काही इतर वाक्प्रचार शिकलो. Above the salt म्हणजे प्रतिष्ठित किंवा महत्त्वाचे, below the salt कमी महत्त्वाचे. The salt of youth म्हणजे उत्साही आणि उत्कट व्यक्ती. आज इथेच थांबू, पुन्हा भेटू Listen here च्या पुढच्या भागात. Bye! To be above/below the salt means to be important/unimportant. In medieval times lords used to sit above the salt. In medieval times, servants used to sit below the salt. To have the salt of youth means to have vigour and passion. He has worked exceptionally hard on the project – he really has the salt of youth. To be the salt of the Earth means someone is kind and has integrity. Peter always does his best to help his colleagues – he is salt of the Earth. To rub salt in the wound means to make someone who is already sad or upset even more sad or upset. Not only did Rob lose his job, but he also lost his house, which really rubbed salt in the wound. जेनला काय वाटलं हे सांगण्यासाठी तुम्हाला योग्य विशेषण वापरायचं आहे. Jane was ______ when the bus drove straight past her. उत्कट, भावनिक यासाठी कुठला शब्द वापराल? If you want to be successful at work, you must have ______. George didn’t fit in at university – everybody else was from a rich family, so he felt like he was ______. Everybody forgot Sam’s birthday, and nobody sent her a card, which ______. Listen Hereचे पुढचा भाग नक्की बघा. तुम्ही आणखी उपयुक्त शब्द शिकाल आणि तुमच्या श्रवण कौशल्याचा सरावही होईल अशा विषयांवर बोलणार आहोत.